There are some spoilers ahead for the entire trilogy. The Broken Earth trilogy is set on a massive continent called the Stillness, in a far-future Earth wracked with periodic disasters known as Seasons. These Seasons aren’t just bad storms: they’re massive, apocalyptic events that last for generations, reshaping the world and its inhabitants. Those who survive huddle into Comms, protected communities that try to wait out the destruction, then crawl out and rebuild civilization before the next event. There are also remnants of an advanced civilization that persist throughout the destruction: giant, floating crystals called Obelisks. Among the survivors of humanity are “orogenes,” individuals who can draw incredible magical power from reservoirs of the Earth. But while these orogenes serve a useful purpose for society, their training and treatment is brutal. They’re taken from their homes as children and brought to the Fulcrum, an order that trains and certifies them under the supervision of yet another order, known as the Guardians. When the Seasons come, they’re often singled out for death from Stills, their non-magical counterparts. Jemisin sets up a fantasy world unlike any other that I’ve read, blending together fantasy and science fiction in this far-future Earth, and building up a magical system based around the forces of geology: indeed, the name orogene comes from the word orogeny, the process of mountain-building. Once they complete their brutal training, orogenes draw their power from the Earth’s crust, and are sent to where they’re most useful: quelling Earthquakes to trying and hold off the start of the next apocalyptic Season. As someone who grew up with a deep appreciation for rocks, and later studied geology, seeing magicians deal with the Earth as a dynamic object is a real treat to behold. And while epic fantasy often deals with titanic periods of time, Jemisin is the first author I’ve come across who truly understands the sheer scale of time when it comes to geology. The Fifth Season is all about establishing this world and its norms. It opens with the start of a new Season, when a woman named Essun comes home to discover that her husband murdered their infant son and vanished along with their daughter. Jemisin weaves this story with two others: a young girl named Damaya who’s just been sent to the Fulcrum, and a woman named Syenite who’s about to leave for her first mission. The narrative shifts between first, second, and third perspective, and by the end of the book, Jemisin provides a neat revelation: each character is the same person, at different points in her life. These perspective shifts effectively place the reader into Essun’s shoes, conveying her grief, anger, and triumph firsthand, rather than observing from the sidelines in a third-person perspective, or having the character tell you events in the first person. It’s a monumentally difficult task (and the shifts in perspective do mean that the The Fifth Season takes some getting used to), but it’s an incredibly effective tactic, allowing Jemisin not only to tell you the dangers of marginalization, enslavement, or oppression, but to let the reader experience it all through through the eyes of her characters. 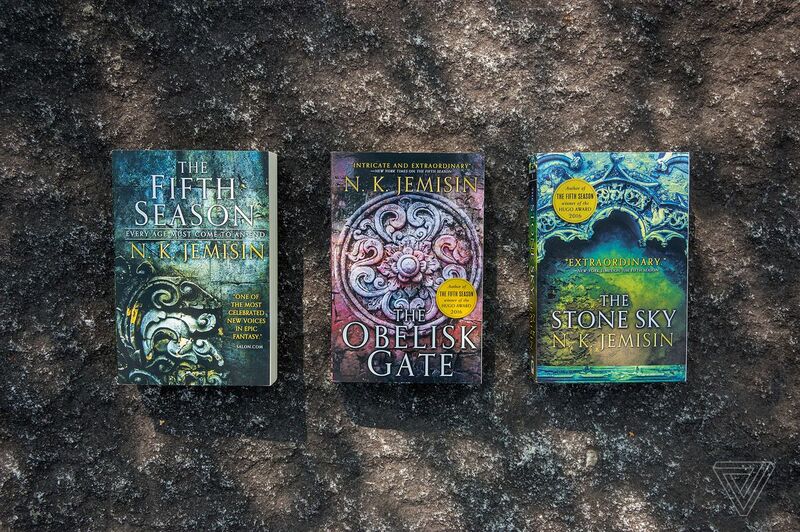 Where the first novel introduces the world, The Obelisk Gate tears it all down, as the Season hits and Jemisin goes full apocalyptic. After the events of The Fifth Season, Essun is still searching for her missing daughter. When she falls in with a community of survivors, she learns that this Season wasn’t inevitable or even natural: it was a deliberate effort by a former partner, who was mortally wounded seeking a way to end the seasons once and for all. But as Essun looks for a way to save the world, Jemisin jumps to the perspective of her daughter Nessun — who is just as powerful as her mother, and believes humanity should be burned to the ground for the injustices against her and her family. The story sets a collision course between the two women, who must grapple with what it means to hold power in a world of desperate people. 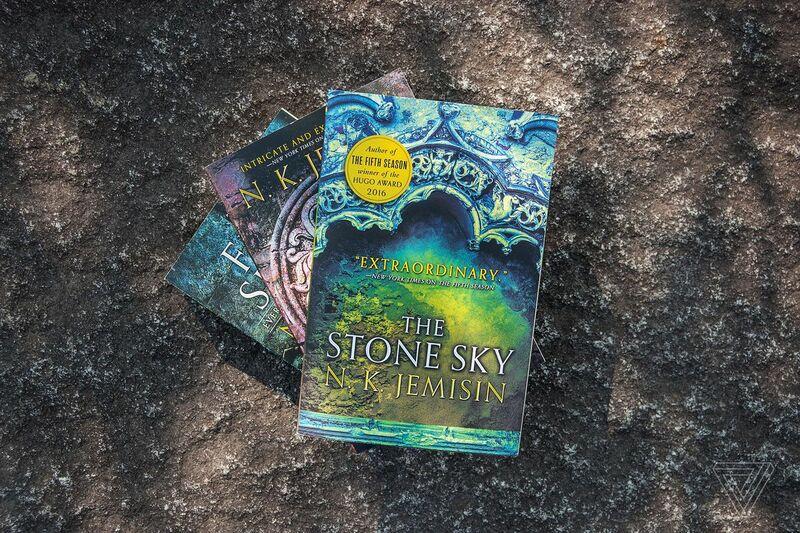 By the time The Stone Sky begins, Essun and Nessun are both traveling to the far side of the Stillness, where they can call the moon back in order to stop the cycle of Seasons — ensuring humanity’s survival on a peaceful planet, or its extinction in a perpetual apocalypse. Meanwhile, Jemison finally pulls back the curtain on the civilization that created the Obelisks, whose pursuit for power nearly destroyed the world, and flung the moon off into the depths of space. At its core, the Broken Earth trilogy is a story about who holds the power in this world, and how society uses and profits off of those that it marginalizes, as well as the destruction that absolute power can mete out. In The Fifth Season, Jemisin lays out an ambitious narrative in an amazingly complex and vivid world, with a story that addresses systemic problems with oppression and power — points that are all too relevant in 2017. 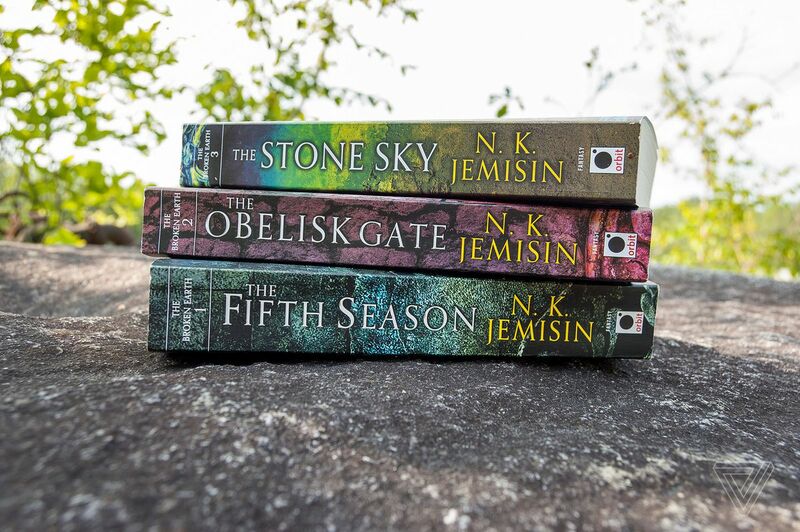 There are plenty of novels that deal with heady, important, and relevant issues, but what really makes this trilogy stand out is how Jemisin plays with language to put the reader into the perspective of those who are at the receiving end of society’s ill intentions. This continues into The Obelisk Gate and The Stone Sky, each of which convey enormously complicated stories between events separated by distance and time, all coming to a single, pivotal moment at the end of the trilogy, where the fate of the world balances on the relationship between a mother and daughter. It’s a moment that left me sitting at the edge of my seat while I read, and Jemisin absolutely nails the ending by showing off a world changed for the better by the character’s actions. Epic fantasy literature often feels as though it’s the byproduct of works like The Lord of the Rings, which plays with its characters in terms of absolutes: a small party bravely venturing forward in the face of absolute evil. Jemisin’s vision of the world here is nuanced, with some characters upholding an oppressive system with the best of intentions, or others going to desperate measures to simply survive to see another day. The result is a story that tells a deeply human story of flawed characters working to not simply survive, but the lengths that they need to go in order to change a world that is literally and figuratively broken. Excitingly, it looks as though we’re going to see a bit more of this trilogy: Deadline announced that TNT is developing the first novel for a potential series from the producer behind Syfy’s Helix, CBS’s Sleepy Hollow, and Fox’s 24: Legacy. I found myself wondering what this trilogy might look like if given the prestige TV treatment, and while it would be a tall order, it’s a project that I’d love to see done right.